Were classified government subjects discussed ? Alireza Monfared, the Iranian oil trader who reportedly purchased a diplomatic passport, through the Prime Minister of Dominica, is an Iranian intelligence agent, a fact that apparently was not considered relevant when his passport, which allows him to evade customs searches in most Western countries, was issued to him, in Malaysia. Reliable sources in North America have twice confirmed his occupational status, and further stated that his storied "extradition," which was funneled through Havana and Moscow, was aided and abetted by intelligence agencies of two other nations. Was he too valuable to risk falling into American hands en route home , and was the extradition really a recovery operation ? We cannot say, but there are more questions than answers at this point. 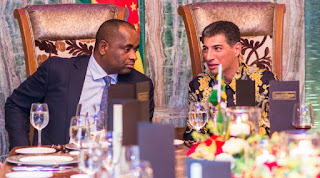 Apologists for Dominica's diplomatic passport program, which was not part of the Citizenship by Investment project, and therefore not subject to its due diligence, have asserted that Monfared was indeed vetted, by a New York firm. The report, of its investigation, has never been released to the public, so we do not know whether the investigators failed to learn of his true background, or whether it appeared in the report, and was suppressed by the Skerrit government. The diplomatic passport program has been totally opaque; the Foreign Minister refuses to release the program's due diligence reports them to the public, which in and of itself is ground for her resignation or removal from office, since at least six of its passport holders have been arrested. Whether she has exposed herself to charges of providing material assistance to terrorists, or violations of international law, are legal issues best answered by attorneys at the US Department of Justice, or even the United Nations, this article is focusing on the possible damage, caused by the presence of an experienced Iranian intelligence agent, residing in Dominica, for several months, in the company of the country's senior leadership. While I have been doubtful about the true of the recent rumor, claiming that there have been visits to Dominica by agents of American law enforcement agencies, I have again heard the stories. Were they seeking information on Monfared's activities inside Dominica. trying to ascertain whether he was not the only foreign national gathering intelligence there for Iran ?